Prestige — A. N. N.
The Locals Market is an institution for Sydney plant lovers founded by Talia Smith. All produce is sourced directly from local Sydney farmers and collected fresh at 4am Saturday before being packed into returnable calico bags for pickup at the Paramount Coffee Project. Starting out as The Local Harvest Collective and operating out of a few different locations before settling on it’s home at the Paramount Coffee Project. The Local Harvest Collective was ready to be rebranded to represent it’s evolution into the The Local’s Market and it’s permanent Saturday morning home. The Local’s Market supports local producers, gives back to the community and ultimately provides beautiful fresh seasonal produce weekly from the market to you. To infuse this personal, community minded nature into the branding, a hand drawn font was created as the backbone of the logo. Along with some naive illustrated thyme leaves creating a shelter above the wording. Ever evolving the branding is used with or without the thyme leaves. Simple and thoughtful. Just like The Locals Market. A.N. 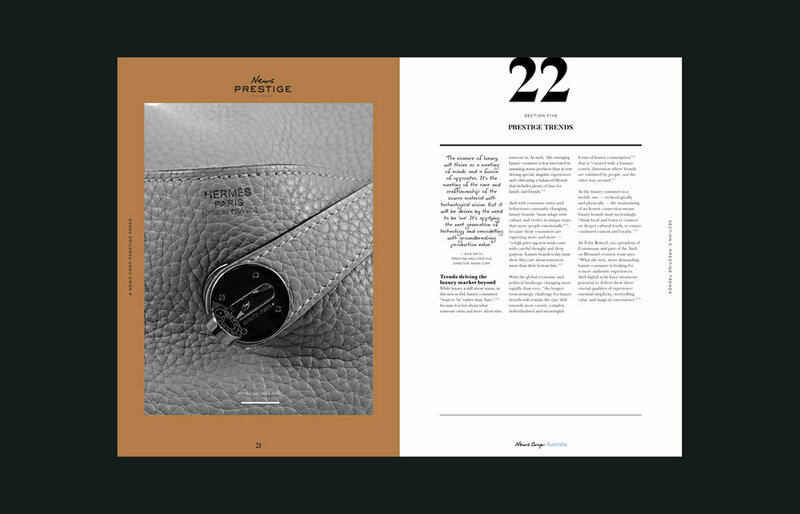 N. was engaged to design 'The Prestige Promise: Redesigning consumer luxury in 2017' whitepaper — a publication that would be viewed both online and in a limited printed version as part of the launch of the News Prestige Network. 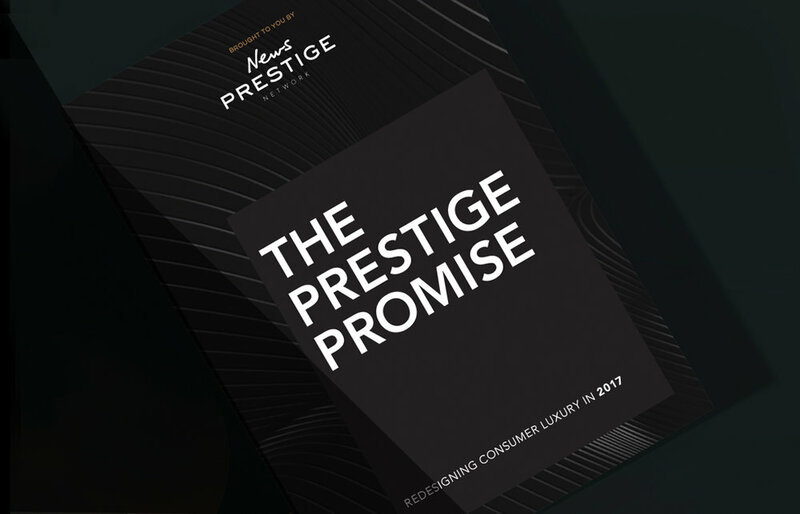 The Prestige Promise whitepaper is the first trend report published by the News Prestige Network and was an integral part of the launch of the newly named network. Offering insights into the trends currently affecting luxury purchasing around the world, its purpose being to further establish The Prestige Network a formidable authority on luxury. 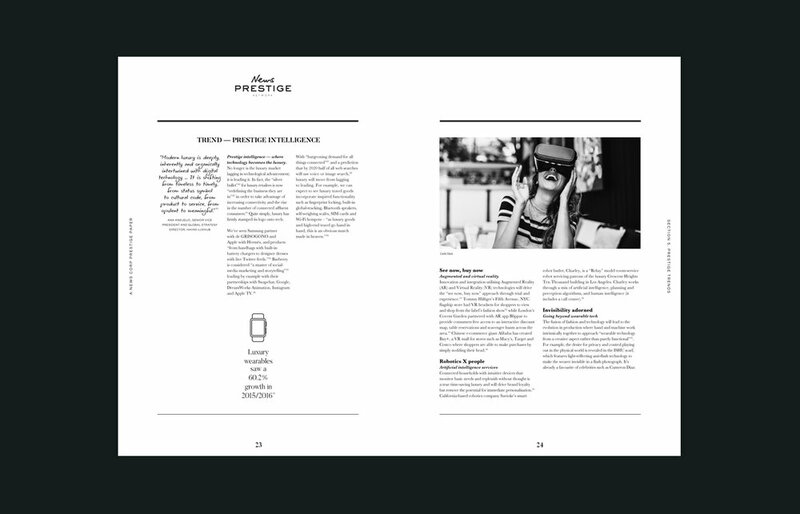 The end result is a 50 page document that utilises white space and clean typography to create an elegant easy to digest publication. You can download the full report here.